The USNV-14B is one serious piece of nightvision equipment developed for military and law enforcement applications that you can enjoy for your own. It is a tiny goggles unit for what it is-a fully waterproof, nitrogen purged device equipped with brilliant optics and the best of the world's efforts in image intensifier tube technology. The intensifier tubes are the best manufactured by ITT Industries, yielding a bonafide 64 linepairs per millimeter of tested resolution for real world detection and recognition capacity that can literally save lives. The housing is absurdly tough, military specification rigidity that can withstand extreme temperature as well as submersion into 66' of water. 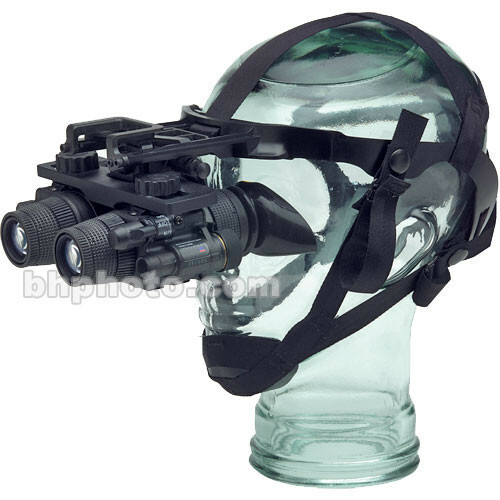 As it arrives it is a 1x dual-eyed goggles unit, but it can be separated to create two monoculars as well as converted into a binocular with the optional 5x military lenses. PLEASE NOTE: There are many variables which influence the distance one sees with night vision devices-amongst them the object's size, the level of detail being sought and the observation conditions. Night vision devices detect much further under a full moon and clear skies than they will under a new moon and cloudy skies. Many different formulas are used to determine the statistic of maximum viewing range and this varies by manufacturer, so ultimately the generation of the intensifier tube is much more relevant than any quoted statistic when determining the maximum viewing range. All night vision devices sold by B&H have mechanisms in place to protect the intensifier tube from a sudden burst of bright light, but this does not mean that bright light doesn't damage the device. Bright light in any form is not good for the longevity and performance of image intensifier tubes. Note: Export of this device described herein is strictly prohibited without a valid export license issued by the U.S. Department of State office of Defense Trade Controls, as prescribed in the International Traffic in Arms Regulation (ITARfwczzatquryerf), Title 22, Code of Federal Regulation, Parts 120-130, and/or the U.S. Department of Commerce. For further information contact the Office of Defense Trade Control and/or the U.S. Department of Commerce. Dual intensifier tubes from ITT provide exceptional resolution(64 lp/mm) which aids greatly in detection and recognition of subjects.